Over the past several years, the fields of Leadership Studies and of Women's Studies have grown tremendously. This book, which is a series of case studies of women who have headed governments across the globe, will discuss the conditions and situations under which women rose to power and give a brief biography of each woman . A special chapter on why no U.S. woman has risen to the top, and a review of the political campaigns of Hillary Clinton, Michele Bachmann and others will be included. 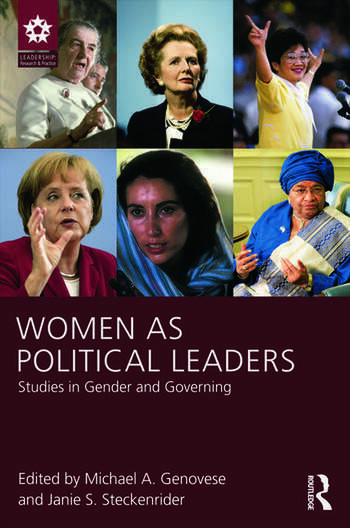 This book will be of interest for courses in women and leadership, global politics and gender studies. Michael A. Genovese holds the Loyola Chair of Leadership and is Professor of Political Science at Loyola Marymount University, where he directs the Institute for Leadership Studies. Genovese is the author of over 30 books, including (with Thomas E. Cronin) Leadership Matters: Unleashing the Power of Paradox (2012) and A Presidential Nation: Causes, Consequences, and Cures (2013). Janie S. Steckenrider is Associate Professor of Political Science at Loyola Marymount University and focuses on the areas of gender politics and political gerontology. She is the coauthor (with Tonya Parrott) of New Directions in Old Age Policies. Her work has been published in the Journal of Women and Politics, Journal of Health and Human Services Administration, Southwest Journal of Aging, and Journal of Alzheimer’s Disease.